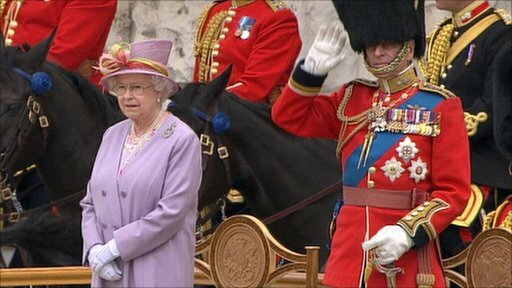 The Queen has marked her 84th official birthday at the Trooping the Colour parade in central London. More than 1,400 soldiers took part in the annual display of military pomp and pageantry on London's Horse Guards Parade. She was joined by the Duke of Edinburgh, the Prince of Wales, her grandson Prince William and other members of the royal family. The 1st Battalion Grenadier Guards were parading their flag colour this year. Many of the battalion's soldiers returned from Afghanistan two months ago. After the Queen took the salute on Horse Guards, the royal family headed back to Buckingham Palace where they watched a 30-aircraft strong RAF flypast. Royal salutes had also been simultaneously fired at Edinburgh and Stirling castles. Trooping the colour has marked the official birthday of the sovereign since the 18th century but no monarch has attended as many birthday parades as Queen Elizabeth. On Horse Guards the colour being trooped this year was that of the 1st Battalion Grenadier Guards - the senior regiment of infantry in the British Army. Two months ago they were serving in Afghanistan. During the six month tour of duty they lost five members of the regiment, including their Regimental Sergeant Major Darren Chant. So amid all the ceremony on Horse Guards today, there was also an element of remembrance for comrades who gave their lives on the battlefield. The flypast was led by The Battle of Britain Memorial Flight - one of the events staged to commemorate the 70th anniversary of the battle. A Hurricane and Spitfire were the first aircraft to fly over the members of the Royal Family as they gathered on the Buckingham Palace balcony. They were followed by Typhoons, Tornadoes, a Nimrod R1 and the Red Arrows - the RAF's aerobatic display team. Earlier, Prime Minister David Cameron and his wife Samantha were among those who watched the trooping ceremony at Horse Guards. The Colonel of the 1st Battalion Grenadier Guards, the Duke of Edinburgh, paid tribute to the armed forces. He said: "One of the great things that the services can do is that they take ordinary people and turn them into extraordinary people. "I think that's what happens, and once they're given the proper training and motivation that interests them, that really turns them around completely and they become very remarkable people." He took part in the parade a few days after undergoing minor surgery to his left hand. His son, the Prince of Wales also took part, despite being advised by doctors to rest because of his chest infection. The prince, who is also the Colonel of the Welsh Guards is set to take three days away from official duties next week. The Duke of Kent, Colonel of the Scots Guard, and the Princess Royal, Colonel of the Blues and Royals, also took part in the parade. The Duke of York, his daughters Beatrice and Eugenie and Prime Minister David Cameron and his wife Samantha were among thousands of spectators who watched the trooping ceremony at Horse Guards. 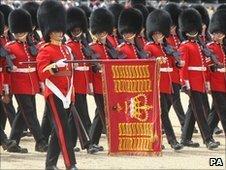 The Queen the presented the new regimental colours to the 1st Battalion Grenadier Guards at Buckingham Palace last month. The parade was commanded by Commanding Officer Lt Col Roly Walker while the Colour was escorted by a guard from Queen's Company. Second Lt James Brown was the Ensign tasked with carrying the Colour. Soldiers wearing the uniforms of the Household Cavalry, Royal Horse Artillery and the Foot Guards were joined by more than 200 horses at the event. Four hundred musicians from 10 bands and corps of drums also took part, with drum horse Spartacus, of The Blues and Royals, appearing for the 12th time. The Queen's actual birthday was on 21 April. Traditionally before battle, colours - or flags - were carried, or "trooped", along the rank of soldiers so they could be seen and recognised. In 1748, it was decided the trooping would also be used to honour the sovereign's birthday. The Queen first took the royal salute in 1951 when she deputised for her father King George VI when he was sick. She has attended every ceremony bar one in 1955 when there was a national rail strike. Earlier the Queen's Birthday Honours were announced, with actress Catherine Zeta Jones, cookery writer Prue Leith and Jimmy Choo brand founder Tamara Mellon among those receiving awards. Trooping the Colour, 2010: Highlights will be broadcast in England and Wales on BBC Two at 1915 BST on June 12.